DO YOUR OPERATORS LOAD AND UNLOAD YOUR PARTS BY HAND? Upstream or downstream of your process, parts have to be handled, picked up, oriented, placed on spinners or attached to racks to then be treated and/or painted. These manipulations take time. They are routinely manual and cause uncomfortable RSI (repetitive strain injury). But how can it be done otherwise than by hand, because the part references are numerous, your production changes frequently and the pins on your attachment supports distort with each handling operation? For more than 10 years our robots have automated these operations. KAMIDO, our bin picking robot for loading these machines from bulk products. SILÉANE MANAGES YOUR BULK PARTS AND YOUR PRODUCTION FLOW! Our expertise (with more than fifty robots installed over the last 10 years) enables us to design your automation solution, taking into account all your parameters and constraints: small and medium series, frequent production changes, configuration of your workshops. We now include the new technologies for mobile and stand-alone robots, capable of creating and managing your multi-reference stocks. 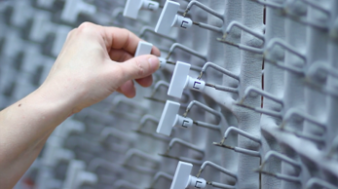 Our mobile and stand-alone robots provide a continuous production flow when your racks are multi-reference, when the ROVALDY machine needs loading, or even if it is necessary to ensure there is an immediate supply of parts if there is a production change (with Rovaldy a production change takes 5 minutes exactly!). Video of Flowpick, it’s a better illustration! ROVALDY is for all types of part, even the smallest. Mind your eyes!